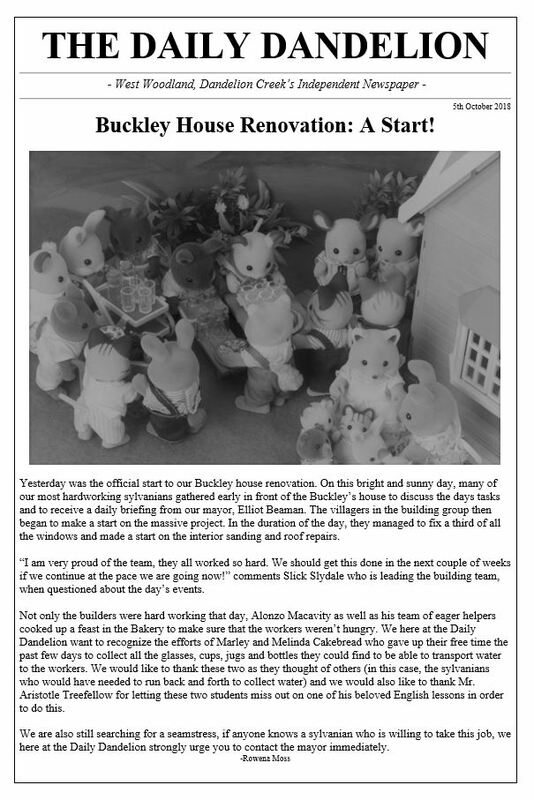 Here is as requested, the article that Rowena Moss wrote and issued in the Daily Dandelion this morning about the happenings in the story I published yesterday! If you haven’t read the story, you might want to before you read this article. It was quite a sunny and pleasant day in Dandelion Creek. After a whole week of clouds and rain it was sunny again and the villagers were very thankful as today was the start of the Buckley’s house renovation. At 10 o’clock in the morning, many of the sylvanians which had signed up to the building group in the meeting Mayor Elliot Beaman had called a week earlier arrived in front of the house, laden with tools, materials and other things that they may need. Not present however was Martin Cakebread who was currently lying in bed with a heavy cold (he had been felling a tree to use for furniture in the rain the day before and had not worn his waterproof clothing). 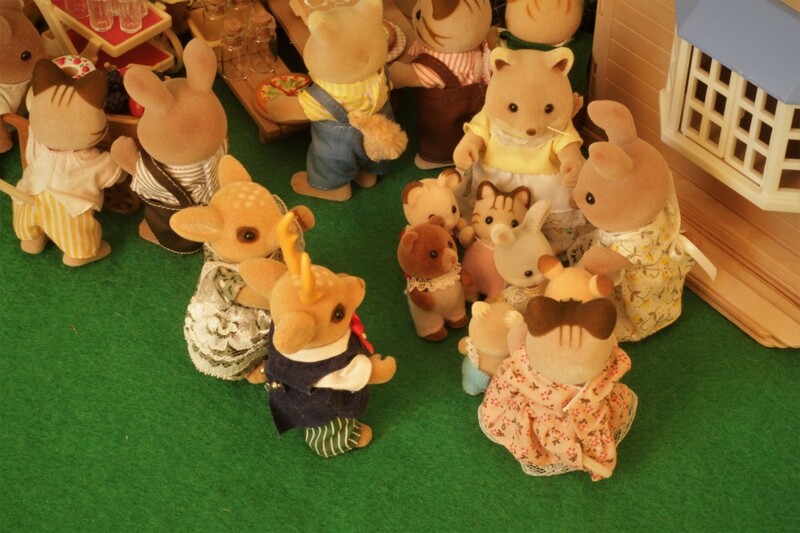 Elliot was in the midst of it all, trying his best to organize everyone. “Come on Herbage! 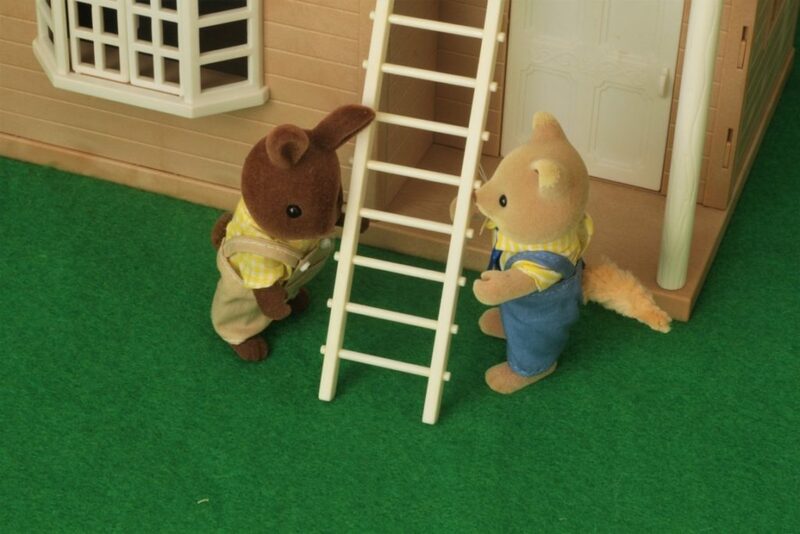 This ladder isn’t that heavy!” called Slick Slydale to Herbage Dappledawn who was struggling to carry his end of the heavy ladder. “I am trying Slick! 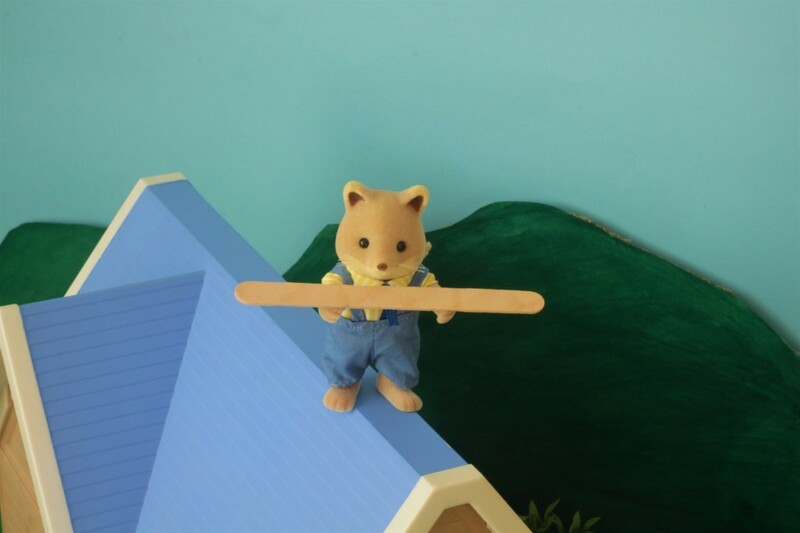 I usually work in the veggie patch where the heaviest thing is the rake!” Herbage replied in an exhausted voice, he and Slick had carried the ladder all the way from the main part of the village which was about half a kilometer away. “You can do it Herbage, keep going!” encouraged Aaron Cottontail who was carrying his saw. It was a very new saw with a sharp blade and a shiny handle, Aaron was very proud of it and this was the perfect opportunity to show it to everyone. 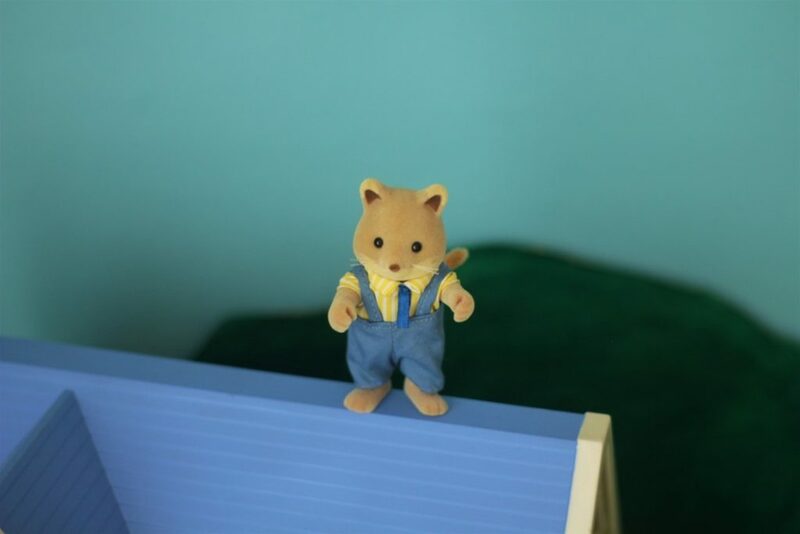 Gladly Herbage put down the heavy ladder, he was very much hoping that there would be no more carrying of heavy things today! 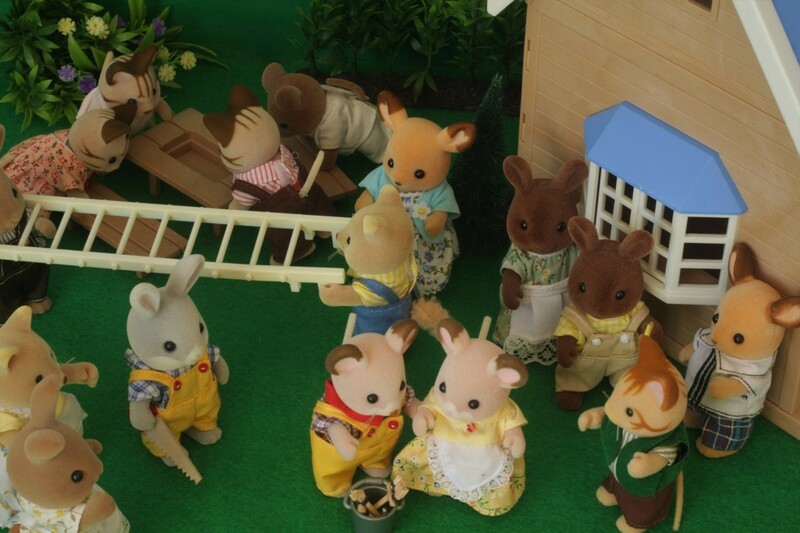 Everyone then gathered around Elliot and he gave the instructions for what he expected the men to be working on today. 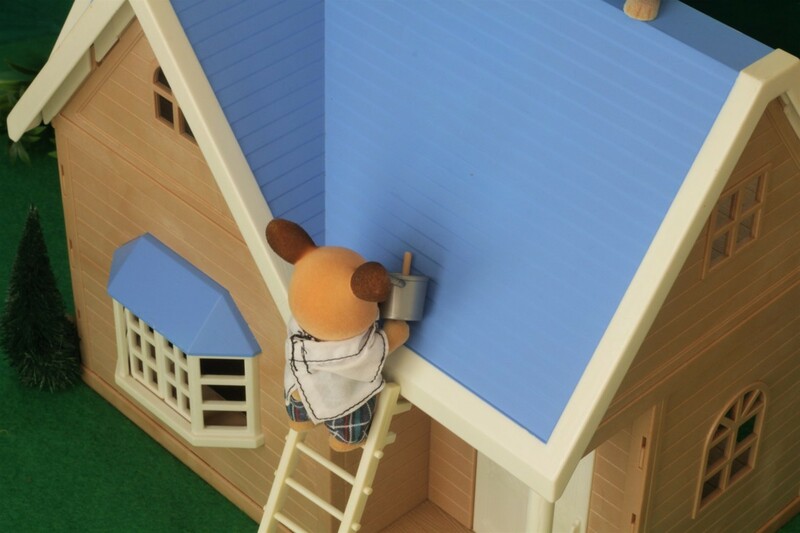 That included repairing the windows and fixing the roof to make the building airtight so that other sylvanians might be able to start working on the interior in an airtight building. He also suggested to do a little test sanding on the floorboards and painted inside walls and ceilings to see whether these needed to be completely replaced or repainted or could be salvaged. No, Elliot really did not know what he was doing, this being his first time as a construction manager, so he often refereed back to a copies of Construction Management; A Guide for Clueless Sylvanians and Construction Management Made Easy both of which he had kindly been given by Martin Cakebread. So, then everyone went to work with Elliot watching over them like a hawk. The men’s first job was to carry the planks of wood from behind the Country Market to the building site. Herbage groaned, this was exactly what he hoped that he didn’t have to do. 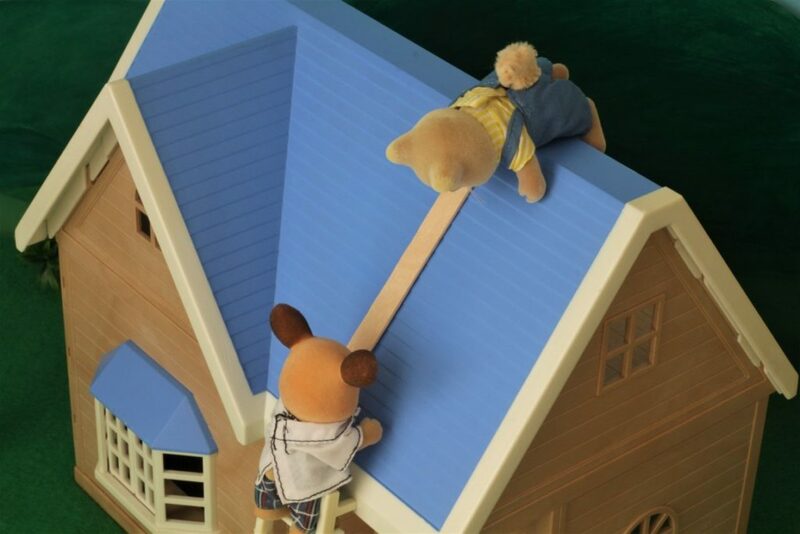 Nevertheless, he partnered up with his good friend Darcy Fielding who was also not very fond of the idea of carrying planks. 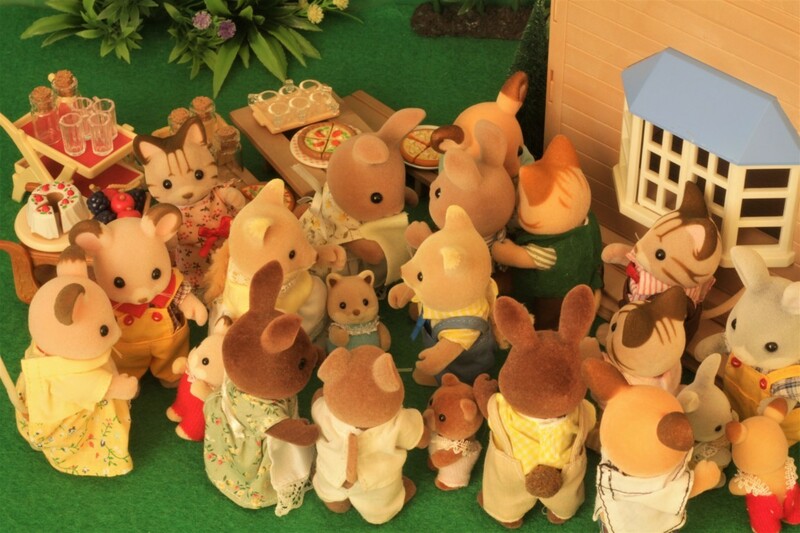 “Come on everyone! 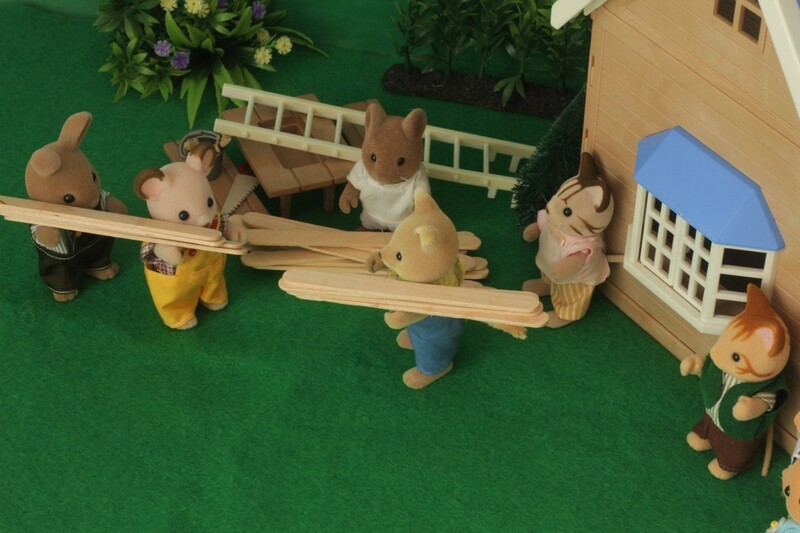 We need to get these planks moved and don’t have all day!” called Slick who was back already carrying six planks by himself. Everyone just stared at him in wonder, how he managed to carry such heavy loads was beyond them! Henry Hazlewood just smiled to himself, Elliot was obviously taking his new role very seriously and already looked a bit frazzled. 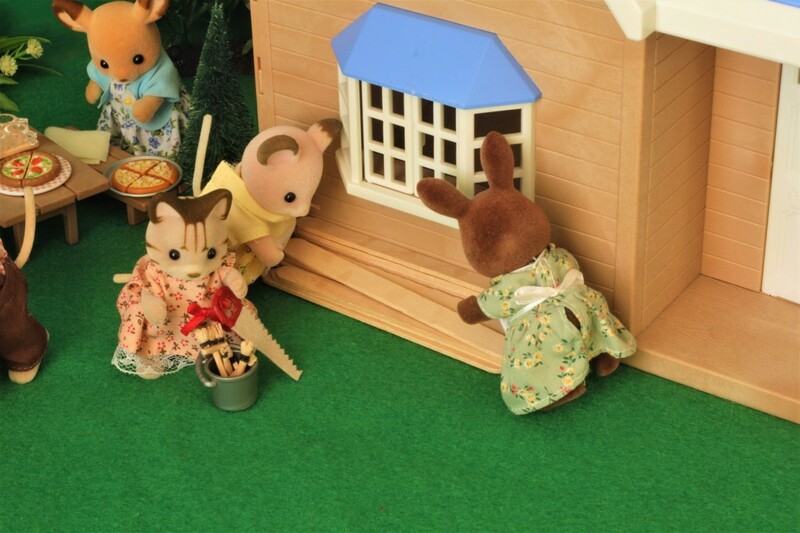 Once the site had been tidied, people began to split up and carry out various tasks. Herbage was in charge of fixing some of the windows, beginning with this one. He sanded for a while and then realized that there was a gap between the top of the window and the window frame. 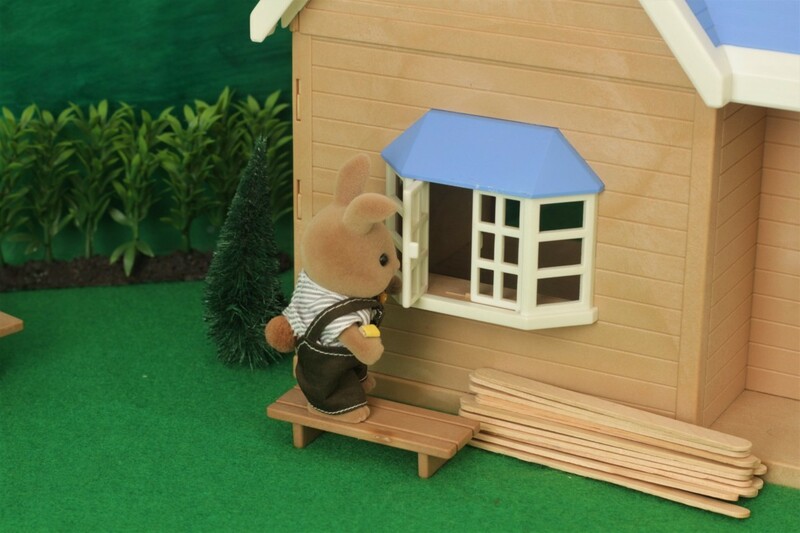 “Lupin!” he called, “I need a small piece of wood the length of this window! 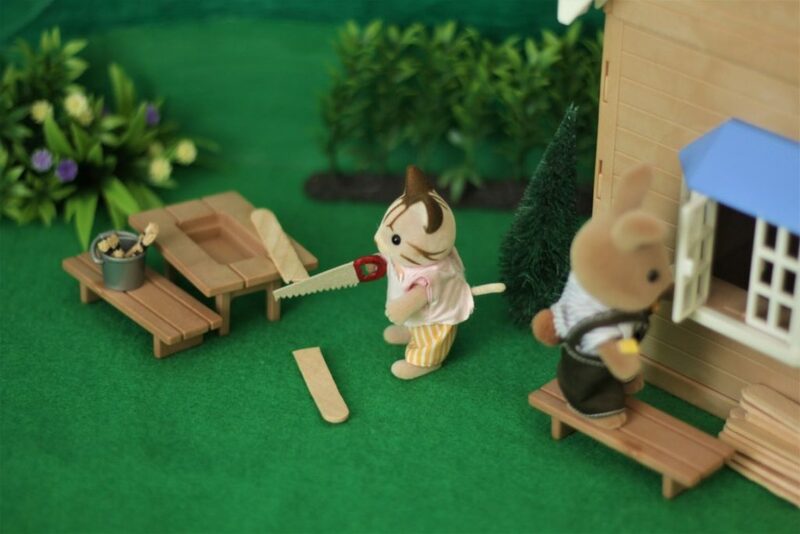 Lupin Macavity was cutting a plank of wood using Aaron’s shiny new saw when he heard Herbage’s call. 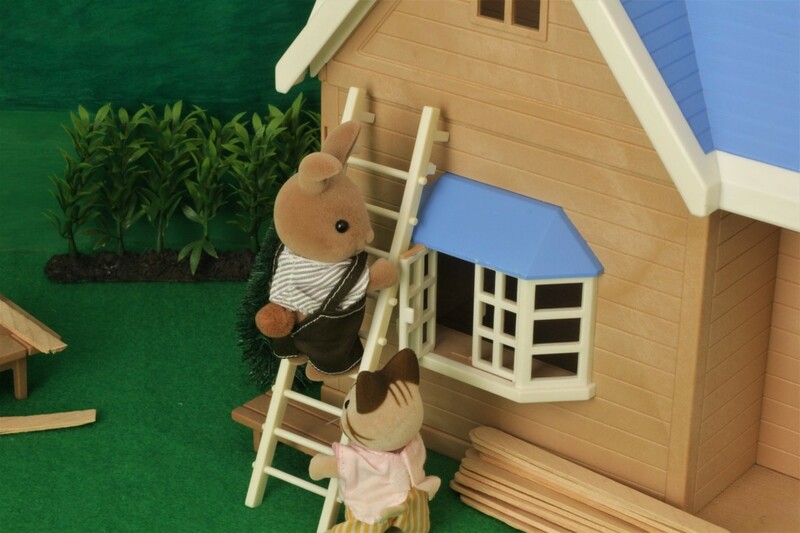 After the piece was finished, they both put up the ladder and Herbage climbed part way up and positioned the piece with a few nails on the window frame. 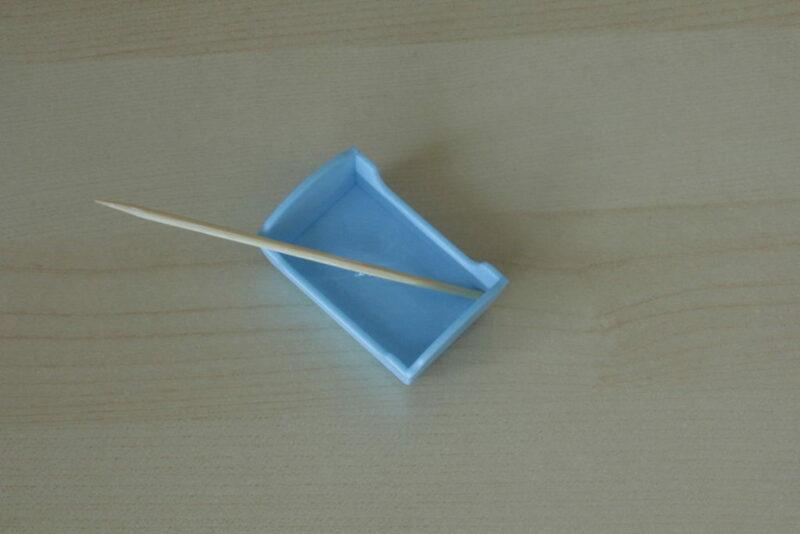 Lupin then passed a pot of glue and a paintbrush which Darcy had thankfully remembered to bring. Herbage dipped the paintbrush into the sticky glue and spread it over the piece of wood to be extra sure that it would stay in place. One window repaired, five to go! Inside, Darcy was teaching Henry how to properly sand the painted ceiling in the upstairs room. The paint had awfully yellowed and in places it was very dirty. “Just stand here and then make small circles with the coarse sandpaper and the paint should come right off” he demonstrated. “Yes! That’s perfect! 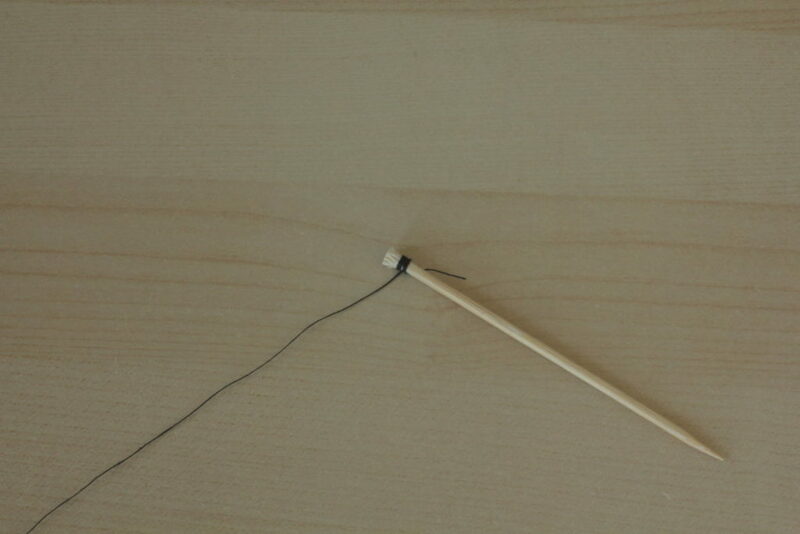 You could do this as a job Henry!” Darcy laughed. 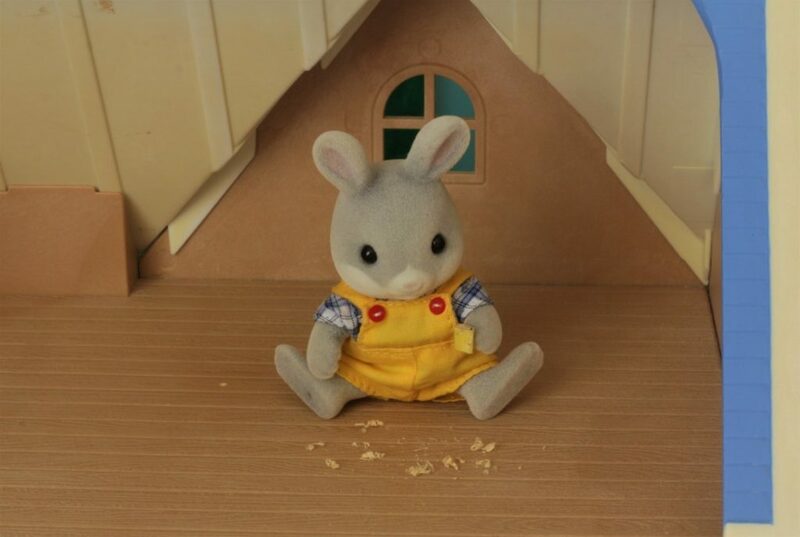 Darcy left Henry to it to pick up his son Jamie and his friend Charlie Cottontail from the Nursery. They had both really wanted to come to see the build! Aaron was starting to sand the floor and found that some of the flooring underneath the leaks in the roof would have to be replaced while most of the other flooring was in good condition and could look quite nice once fully sanded and stained. 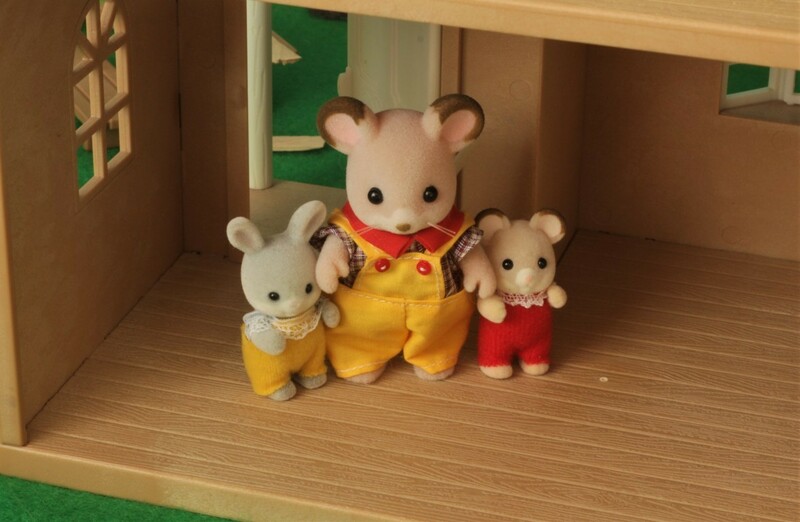 Darcy soon returned with the two excited boys. “Why are you doing that?” Jamie asked. “How are you going to do that Daddy?” Charlie asked. “I am going to time myself how long it takes me to do one square meter and then multiplying it by the square meters of flooring.” Aaron answered patiently. “What’s a square meter?” Jamie wanted to know. “Yeah Daddy, what’s a square meter? Why do you need those?” Charlie asked. “Slow down boys, you will learn all about square meters when you get to school, why don’t you two ask your siblings this evening?” Aaron suggested. “They learn about square meters at school?! Daniel and Maisie must be so smart!” Jamie cried in astonishment. After a quick lunch of sandwiches, roasted vegetables and a drink of water, the men all went back to work as energized and motivated as ever. 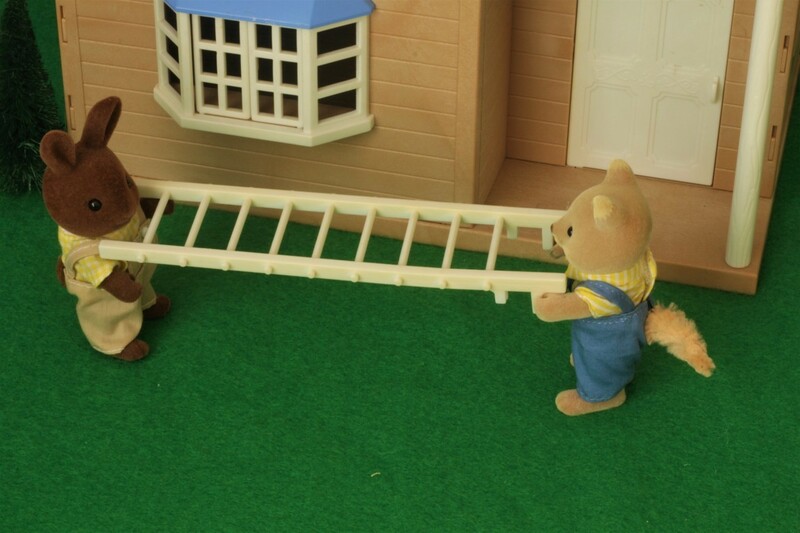 Herb Wildwood was helping Slick to set up a ladder so that Slick would be able to safely climb onto the roof and begin repairing it. 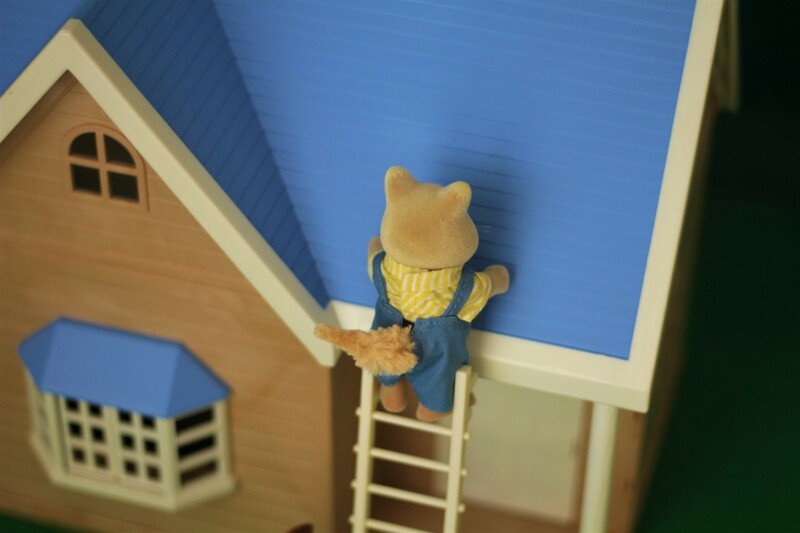 “There, now I will hold the ladder and you can climb up.” Herb declared and held onto the ladder tightly with both of his paws. 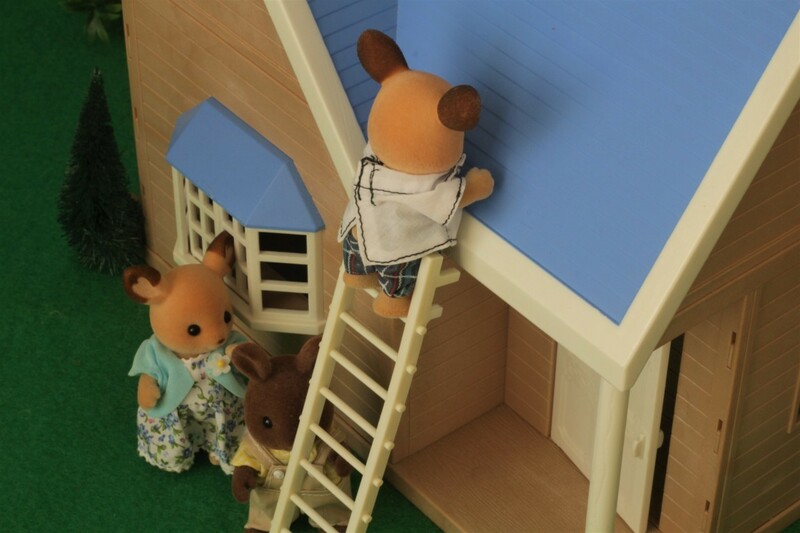 Unfortunately, the ladder was a bit short and only just reached the roof so Slick had to climb to make in on top of the house where the majority of the leaks appeared to be. 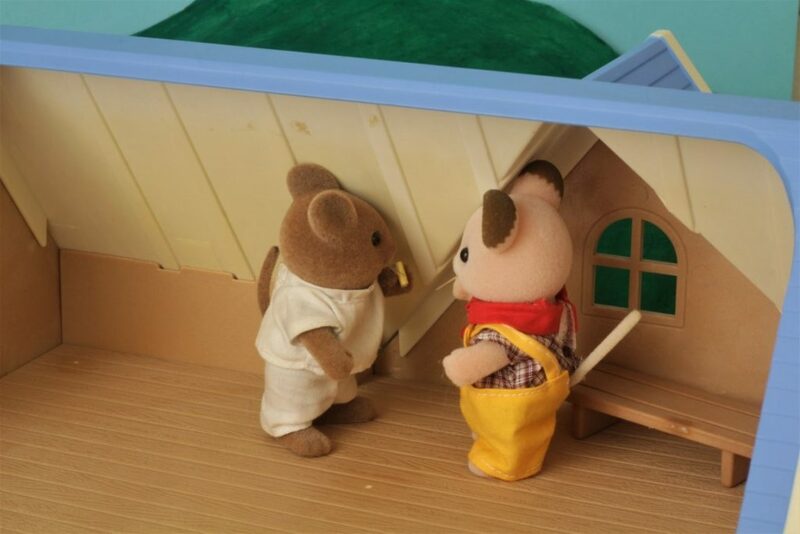 Rupert Buckley who had been standing near when Slick had called, quickly raced to get him a plank of wood. Carefully, he made his way up the ladder with it. 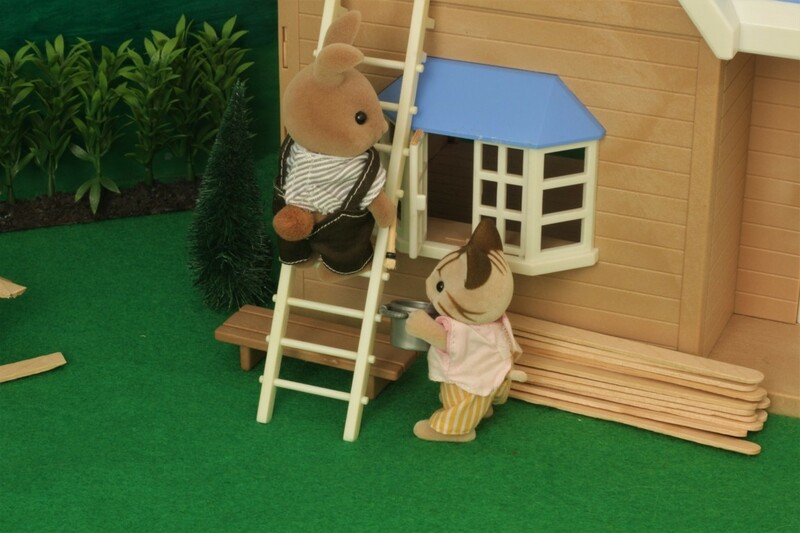 Rupert, grabbed the glue bucket and brush as well as a hand full of nails and climbed back up the ladder with them. “How am I going to get these things to you Slick?” he wondered. “First of all, throw me the nails one by one, I am a good catcher and as they are large, this shouldn’t be too difficult.” ordered Slick and positioned himself as close to Rupert as he could. 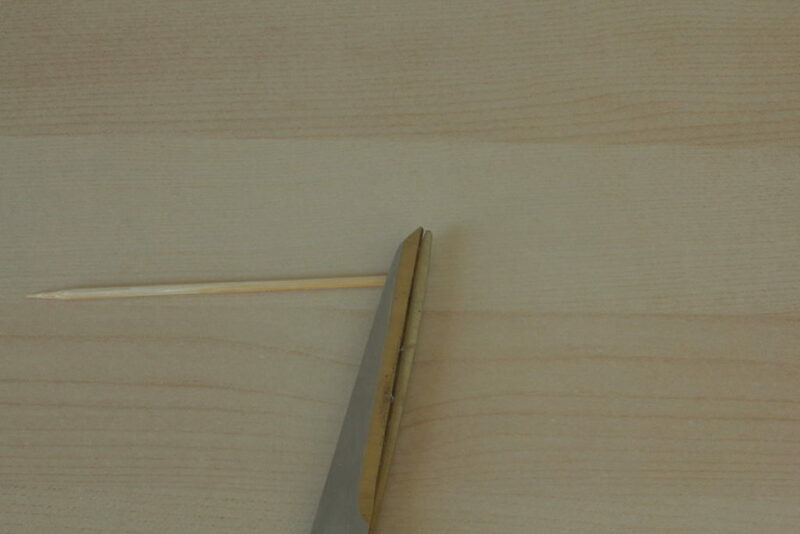 Rupert threw the nails one by one and one by one they were caught by Slick and placed into the pocket of his trousers. 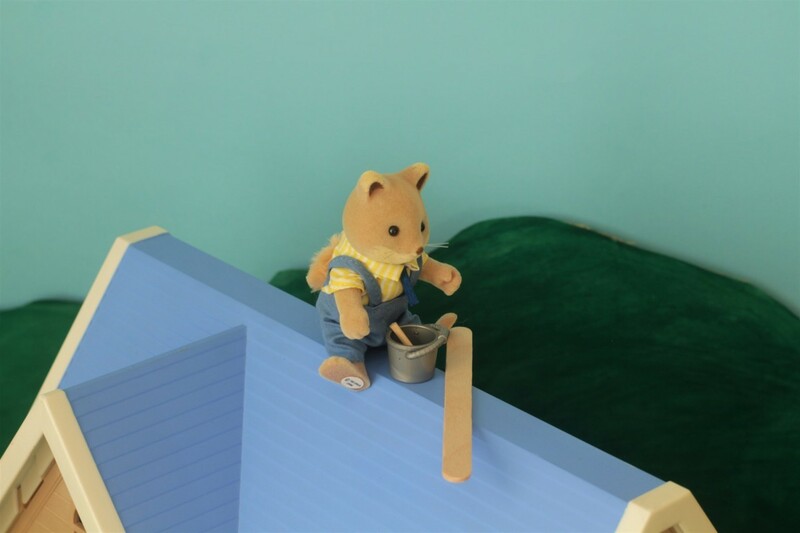 “Now you have to climb a little way up to pass the me bucket and brush” he announced once all of the nails were in his pocket. Very, very slowly Rupert began to make his way up the roof carrying the bucket and brush. It was very hard work, Rupert naturally wasn’t a very good climber and with only being able to use one hand made it even worse but he was determined to do it so carried on. 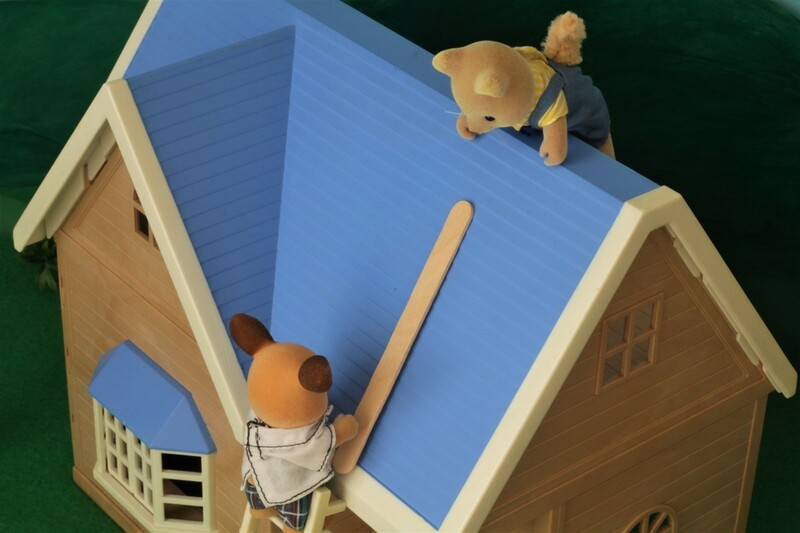 “Only a few centimeters more Rupert and I can reach the handle.” Slick encouraged and was then finally able to grasp the handle. “Rupert David Buckley!” came a shriek from below. 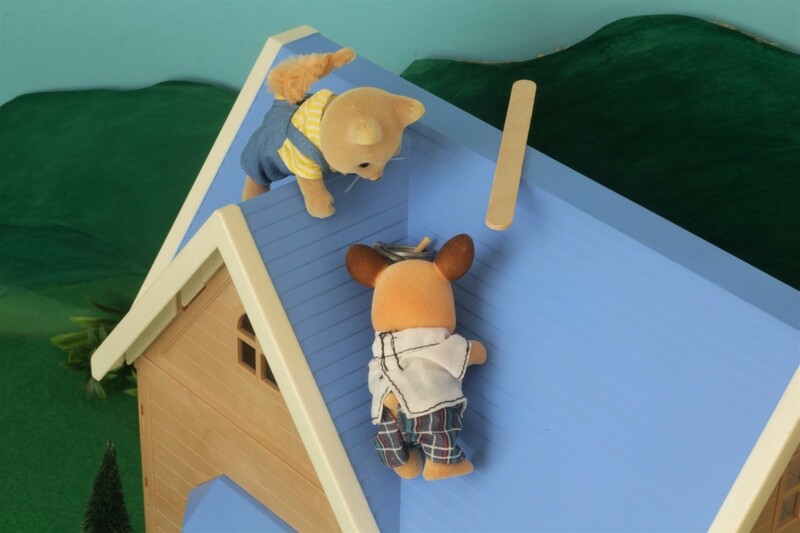 Rupert was so surprised that he nearly fell off the roof! It was Agatha Buckley, his wife who was shrieking at the top of her voice. Once Rupert had climbed down from the ladder he got a very stern telling off which he was very sure he would never forget. 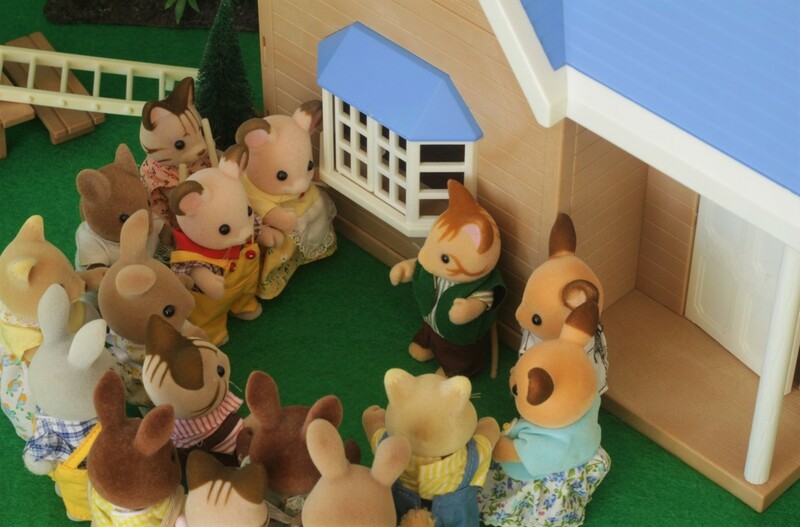 All of the other sylvanians had come out to see what the commotion was about but quickly backed off when they saw Agatha. Sweet, dear Agatha was very, very scary when she was angry. 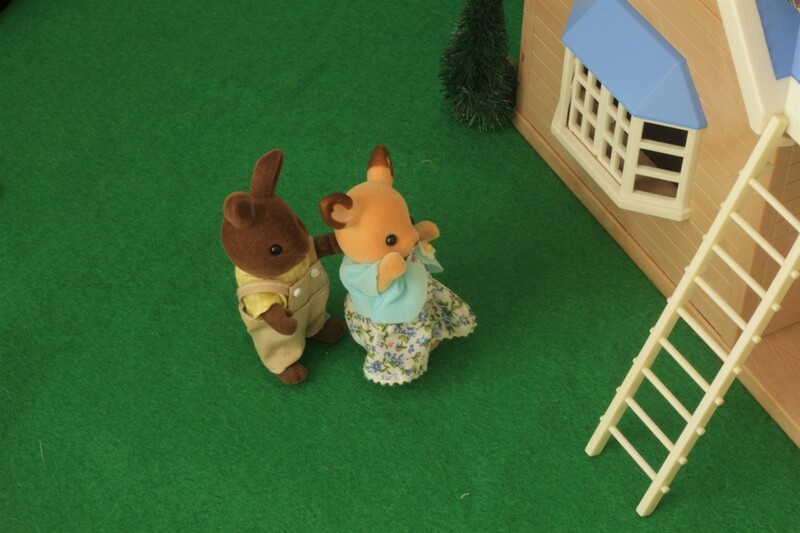 “Calm down Agatha, I am fine.” Rupert responded but immediately regretted opening his mouth. Telling an angry person to calm down is never a good move! Agatha continued to scold Rupert for another solid few minutes before she finally calmed down and dragged her husband away to the village muttering something about how she was going to make him wash all of the dishes in the Bakery as a punishment for giving her such a fright. Slick in the meantime finally had everything he needed to brace the beams so made a start to his work. It was getting late in the afternoon and the workers were getting hungry! 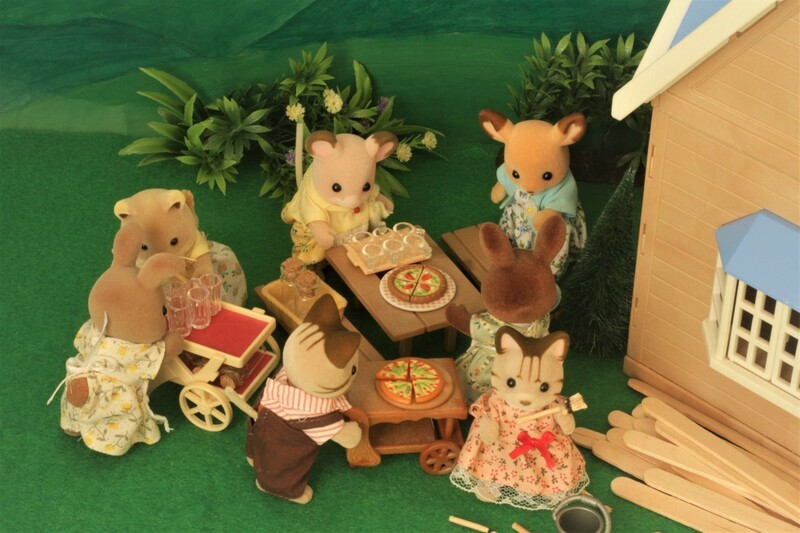 Thankfully, a group of volunteers had spent the afternoon making pizzas after pizzas in the Bakery. Marley and Melinda Cakebread had also went around the village to collect all of the cups and bottles that they could find and filled them with water which they put on the trolley to go over to the building site. Some of the volunteers began to pile the food onto the picnic table and chairs and then quickly walking back with the serving trolleys to get more food. 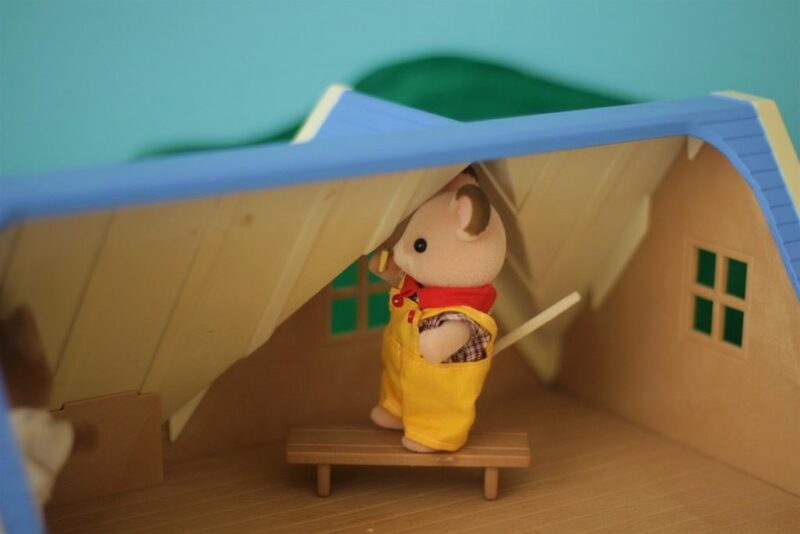 “Look at that, brushes all over the place and just a pile of planks, really, what a mess!” exclaimed Clara Macavity in disgust and began to tidy up. 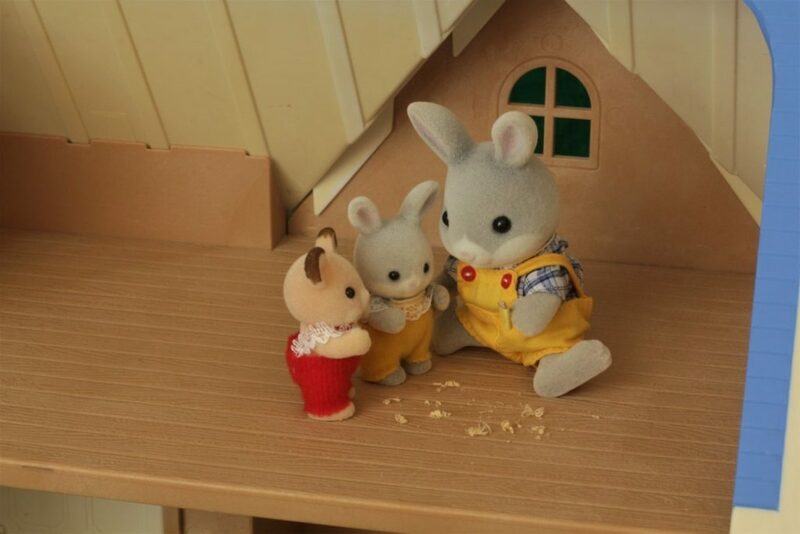 “Oh yes, Elliot would get a heart attack if he saw this, let’s quickly tidy it up before he comes.” Ginger Wildwood suggested. Alonzo Macavity came back at that moment with a group of Nursery children who had all eagerly wanted to come and see what was going on. “Yeah but Daddy did a lot of work with triangle centimeters!” said Charlie Cottontail. “Can we move in tomorrow?” asked Oscar Buckley. 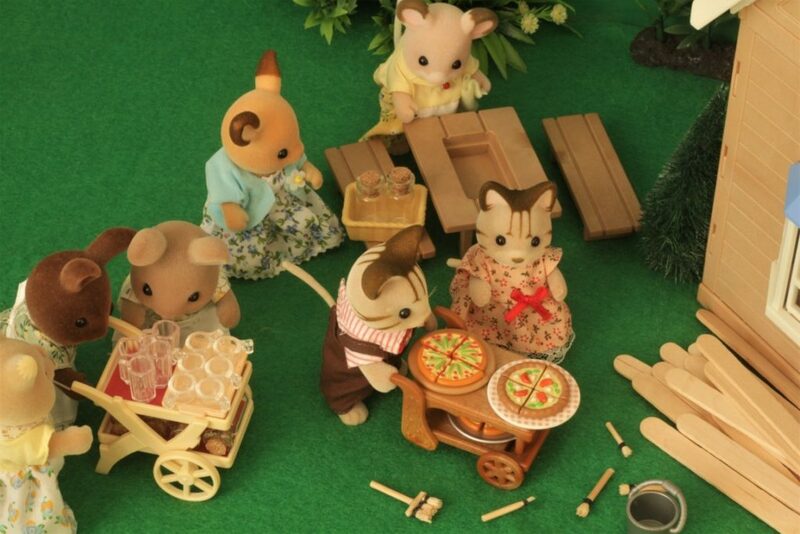 Then all of the workers began to finish their work for the day and saw the food and water. “Wash your face and paws before you eat!” called Theodora Dappledawn who was holding a bucket of water, soap and a towel. The workers then began to tuck in, even Elliot Beaman had made it to see the progress made and to chat with everyone. 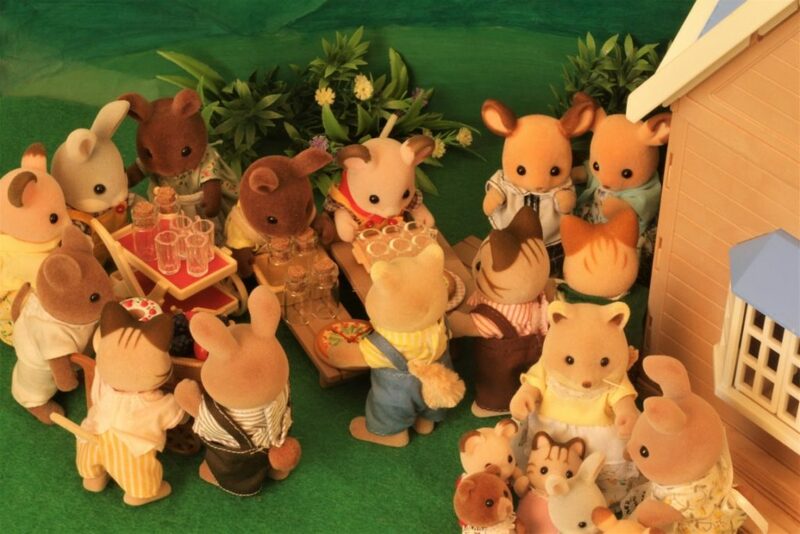 All of the sylvanians were eagerly exchanging stories of what they had done today. Lupin for example was telling Henry how he used Aaron’s new saw and how wonderfully it worked while Henry told him how he had learned a lot about sanding from Darcy. 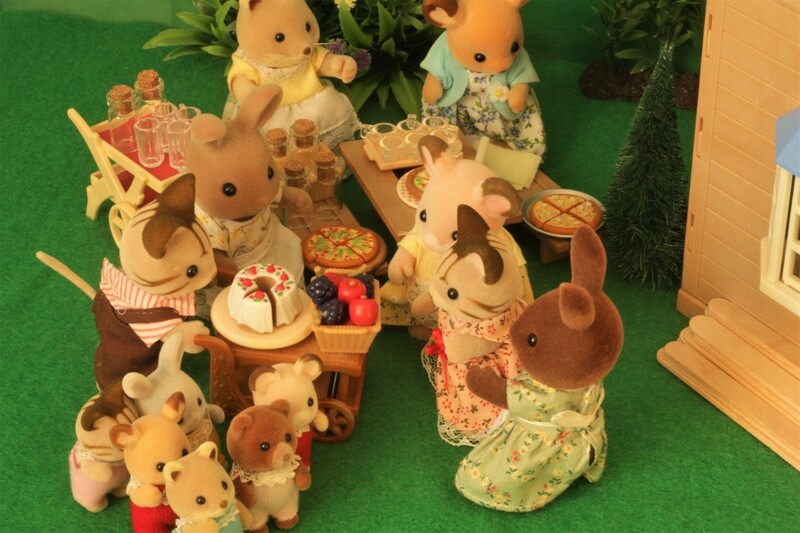 It was quite noisy with everyone chatting and talking at once! “Hello!” called Cameron Moss who had just arrived with his wife Rowena. 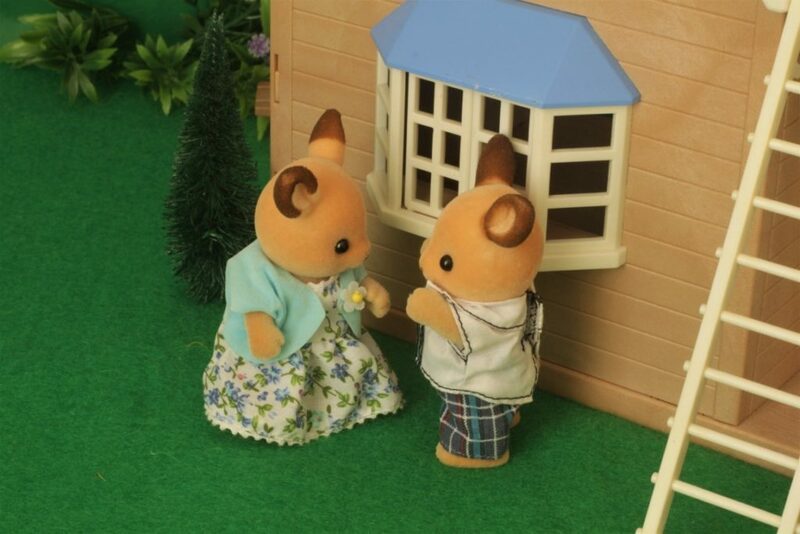 Would you like me to post the news article that Cameron and Rowena will write for the Daily Dandelion tomorrow? If not, I won’t post it but if you do, I will. What do you all think about my photos? They are a lot brighter and warmer which I really like so I am happy with that. Also, I have noticed that recently I have been posting a lot of stories (this story today is very long so I apologize if you don’t like long stories) so I think that nest week or so I will post a tutorial to change it up a bit. 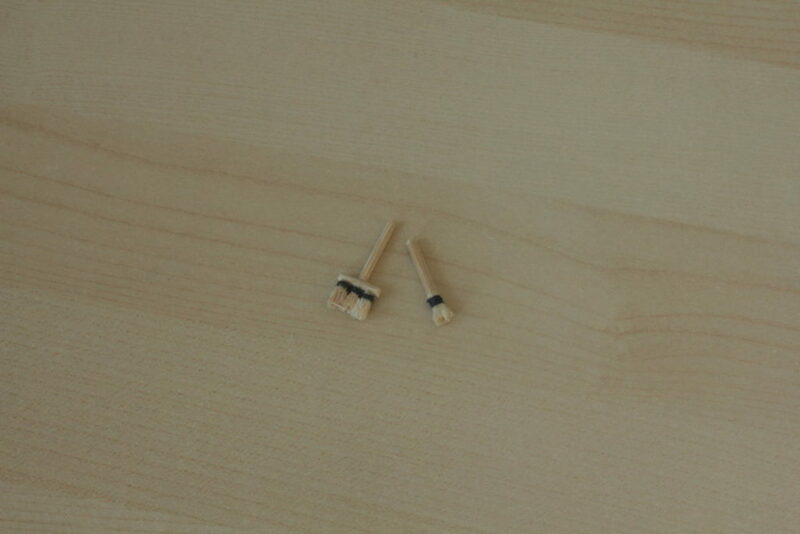 I will be posting a tutorial for the brushes that some of the workers used in this story so you can look out for that. I hope that all of you will have a great week!